Helen Margaret Calvey was born in Orpington Kent and started her nursing education at the Royal Free Hospital in London graduating in 1963. 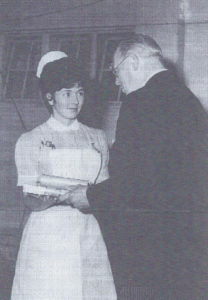 During this time, Helen won an award as the most helpful operating theatre nurse. Helen emigrated to Canada with her husband in 1964 and after qualifying to work as a Registered Nurse in Canada started in the OR at Vancouver General Hospital in 1966. Helen dedicated her working life to perioperative nursing and loved working with children. She was Assistant Head Nurse of the Pediatric and Orthopedic operating rooms in VGH Heather pavilion before moving to Children's Hospital where she spent more than 30 years. While at VGH, Helen participated in the first separation of conjoin twins at the Hospital. Helen was respected for her expertise and compassion by nurses, doctors and other members of the health care team. Following her retirement in 2003 she volunteered for 6 overseas missions with Operation Rainbow to assist cleft pallet victims in third world countries. Helen was an active member of the BC Operating Room Nurses’ Group and among her many positions she held office as the Regional Presiding Officer for the Vancouver Region as well as Chairperson of the Hostess Committee for numerous conferences.